Raised in Soviet-era atheism, Russia’s older generation likes to believe that God and scientific knowledge are incompatible. Younger scientists on the other hand, without having experienced the heavy burden of Soviet propaganda, are rather open to listening to God’s opinion. Being a journalist, especially one covering science, is very stressful, especially for a woman. Whatever the color of your hair, when you’re talking about the Big Bang or genetic engineering with some professor, you’re always regarded as a dumb blonde. That’s just how it works. Over in the United States, for example, journalists are regarded as great intermediaries between society and science. What they write determines whether or not a scientist will be awarded a grant. Over here, in Russia, a journalist is the proverbial fifth wheel. I am little more than an insurance agent, offering a ticket to eternity to those who want to live only in the present. But this is exactly what gives me the vantage point of an outside observer, capable of drawing my own conclusions. Research the researchers. Study the scientists. For example, over the past two or three years I have been running a personal opinion poll entitled Is there a place for God in the mind of a contemporary scientist? My polling methodology has been hardly original. I kept asking the same question to all Russian scientists with whom I had a chance to talk: Do you believe in God? The answers have been strictly age-related. Renowned scientists in their 60s answered a definitive “No.” Younger people up to 35 – 40 years old were just as confident in answering “Yes.” Those between 40 and 50 years of age were split down the middle. There was no correlation to the field whatsoever. I observed the same trends across the range of specialists in science, liberal arts and technology. Whatever field you examine, older scientists flatly refuse to acknowledge the existence of a supreme being, whereas their younger colleagues are true believers. What exactly they believe in is a totally different matter. I have talked to staunch Orthodox Christian geneticists, Catholic engineers and Buddhist physicists. While many admitted they personally were not avid church-goers, nobody doubted the existence of a supreme source of intelligence and love. Academic Vitaly Ginzburg was traditionally considered to be the chief promoter of scientific atheism among the older generation of Russians. “Belief in God is incompatible with scientific thinking,” the older generation’s key slogan went, fiercely promoted by Ginzburg. Meanwhile, the members of the younger generations I polled were invariably perplexed at my question about whether belief in God is at odds with rational thinking. “How can they ever contradict each other?” they asked me on occasion. The world is so perfect and beautiful that there’s no way God wasn’t involved, a 26-year-old biochemist once told me. What else could explain all this beauty and perfection? Even if it was just a random set of coincidences and things falling together, the Earth’s creation is still a divine occurrence. Albert Einstein famously said: “God does not play dice.” At the time, calculations clearly showed that randomness lies at the base of the micro world. Einstein spent years to prove the opposite, while Niels Bohr wisely advised scientists to stop telling God what to do with his dice. After ridding itself of the Jules Verne-style positivism of the 19th century and the revolutionary romanticism of the 20th, science came to a halt at the threshold of a swirling existential mystery. Every new piece of knowledge acquired by scientists today not so much changes our idea of the world around us as reveals the imperfection of the questions we ask. A young physicist explained to me once the key mystery of scientists’ dialogue with God. As a matter of fact, between the Big Bang and now, the universe had a lot of chances to make sure life never happened. As it developed, the world was constantly finding itself at a fork in the road, where the choice of a further scenario was totally unpredictable. But each time, a choice was made from a myriad of options in favor of one that made life and intelligence possible. Why? 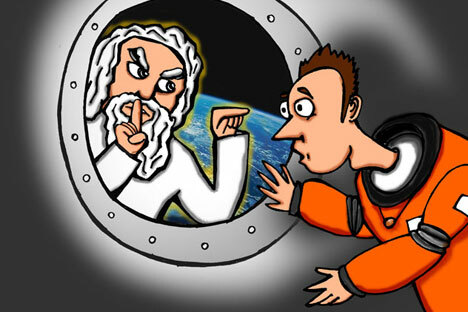 God’s and science’s areas of responsibility have split exactly along the lines of the quality of questions being asked. Scientists want to know how the world works, but only God knows why it works the way it does. I’m not sure who said the wonderful phrase, “God is the dude who always keeps silent,” but young scientists can’t help feeling the presence of this silent figure. They know the answer is out there. All they need to do is find it.